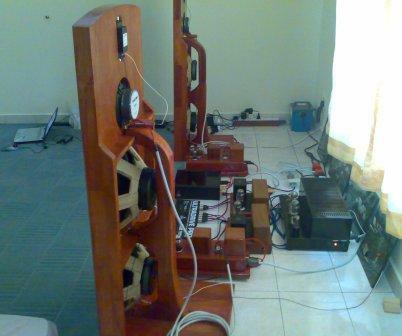 CS is an audiophile from Kuala Lumpur. This page is about CS audio system. I knew him through the internet few years ago. He’s really a fast learner and dare to experiment kind of guy. Check out the details of his audio system below. Squeezebox Touch (modified software, server based decoding, disabled wireless LAN, disabled screen and volume control) with 600GB of digitized music. The above software modifications improved sound quality by reducing the local server loading. Modifications are based on Squeezebox “soundcheck”. They can be Googled or searched in diyaudio.com. Hardware modifications are only partially done by using wireless bridged mode router to enable Ethernet optimization. The control is via iPhone4 using “ipeng” applications. CS uses Texas Instrument PGA2311 chip as a 6 channel pre-amplifier. It is customized to have 3 stereo sets of individual gain of -12dB and +12dB, programmed into chip. All functions are accessible via a tiny white color Apple remote control. 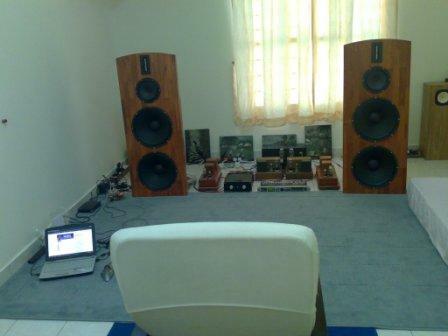 The pre-amplifier is housed in a nice Teak wood chassis and is isolated on 3 point brass spike and footers, or wood spike, with some Cengal wood blocks on glass and solid wood platform. For full range and ribbon tweeter: fully restored original paint Leak Stereo 20 tube amplifier with 4 pc of Mullard EL84 and mixture of 3 pc of Telefunken and Brimar 12AX7 tubes. Mundorf SIO capacitors are used as signal coupling. The Mundorf electrolytic energizes the power supply. For the 4 pcs 15" woofers, class D amplifiers are used to give enough oomph and driving force. Behringer DCX2496 is used for the active crossover function. It is slightly modified with BlackGate NX series output capacitors. CS uses Buffalo II with Placid power supply and IvyIII powered by Placid Bipolar power supply. Volumite micro controller programmed volume control with no degradation of sound quality is used on this system. It is also modified with Trident Regulator from Twisted Pear Audio. Newava S22083 digital pulse transformer is added at SPDIF output. The DAC is able to output single ended (RCA output) and balanced (XLR output) signals concurrently. The DAC is also housed in Teak wood chassis. CS uses open baffle speaker that is made up of >2 inches thick plywood, solid wood and Teak wood. 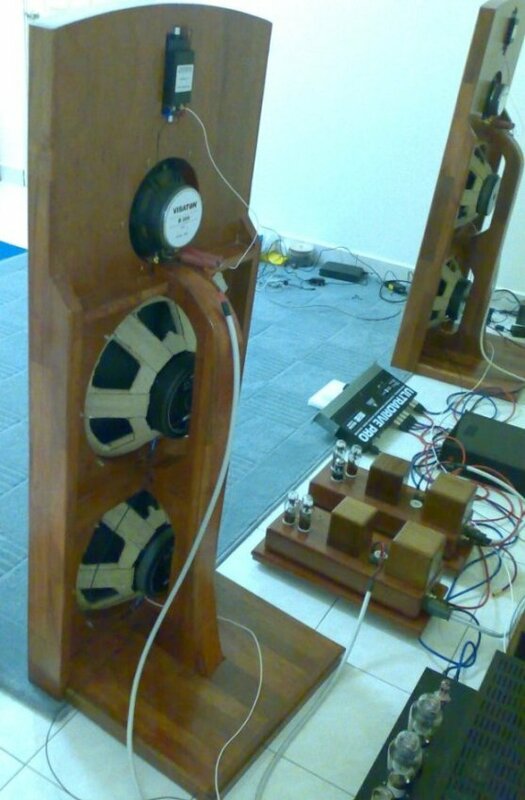 MDF (medium density fiber board) is not used at all in the DIY speaker project. It is configured as a 2 way speaker with Coral and ribbon tweeter with 1st order crossover using Mundorf Supreme, Mundorf SIO and Audio Note NOS oil capacitors. Coral and Eminence drivers are reinforced and dampened to produce better sound. Interconnects are DIY shielded silver plated multi-core wires. Speaker wires are entry level Chord company speaker cables only. Power cables are Supra LoRad 2.5. Whole system power supply is going thru one 1.5kVa isolation transformer. CS uses DIY tube phono preamp that is based on famous Marantz 7 circuit. He uses 3 pcs pf 12AX7 Telenfunken tubes. Mundorf silver in oil and Audio Note NOS (new old stock) oil capacitors are used all over. Step-tp transformer is from AudioNote too. Model AN-S3 silver wire transformer is used for low output impedance cartridge and AN-S2 step up transformer is used for higher output impedance cartridge. Lenco L75 with SAEC WE-308L tone arm mounted externally. The cartridges are from Supex (900 Super II), and Denon (DL-103). Thorens TD-124 with Grace G840F tonearm. Thorens TD-150 MKII with SME3009 tonearm. 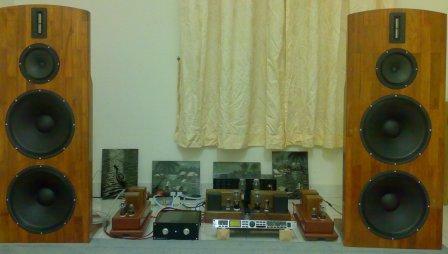 Previous CS audio system – DIY tube preamp from Stranwood.com, Carmen 300B tube amplifier (https://www.diy-audio-guide.com/diy-300b-amplifier-1.html), DIY power amplifiers from fellow DIYers, Behringer DCX-2496 digital crossover, and open baffle speakers with Visaton B200 speaker driver. This is a view from the listening seat for the previous CS audio system. That pretty much wraps up what CS has in store for you! I’m sure there are more things cooking up at his place when we speak. CS never fails to surprise us with more new audio tweaks and gadgets. Ok, just my own impressions, no holds barred but based on my untrained ears on CS Audio System..
Btw, since CS’s system is constantly evolving, what I heard is not the latest/greatest.. from CS’s updates, it seems like the perf took at big jump after the soundcheck Squeezebox mods and tonearm mods..
V good dynamic expression, strong midbass giving a sense of drive and slam… Stimela (Masekela) sounds powerful and with strong impact; I played back thru mine-very un-shiok and no impact; same for most SET setups and small systems I heard. Metallica and ACDC also sounds robust and controlled at high volumes; not easy to manage in most systems; but can be a bit peaky sometimes. Openness in the sound as typical for Obs – sounds live and energetic and expressive. Dynamic music a joy to listen to.Harmonics are sufficiently nice typical of analog/tube. Vocals are not SET seductive.. hard on some materials.. I felt his 300b does better than the Leak in this area; but the Leak has better drive and can control better when played loud. Imaging is not tighly focused and the center image is rather bloated. One other thing, subwoofers definitely are not required at CS Audio System.